Have you ever found inspiration in the unlikeliest of places? Has a quote from a book or an article you’ve read ever given you a pause? Do you often wish you could hold on to those inspirational quotes, phrases, or anecdotes? 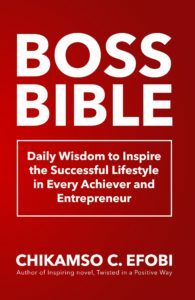 If the answer is yes, then, Boss Bible: Daily Wisdom to Inspire the Successful Lifestyle in Every Achiever and Entrepreneur is just the tool you need to inspire you to reach for success, to give you hope, wisdom, and power when it seems there might not be any. It will empower you and help you to create a better mindset to become the ultimate achiever and an all-round happier person. These quotes are not going to magically transform you into an overnight billionaire, but they will help you to build habits that will change your life and, hopefully, guide you on your journey to success, no matter which discipline you choose. Inside, you’ll find inspirational quotes from the likes of billionaires, business moguls, successful entrepreneurs, renowned thought leaders, well-known and respected TV personalities, and world-famous poets and innovators. You’ll also find thought-provoking, meaningful, actionable words from the venerable queen of messaging and authenticity, Oprah Winfrey. Get your copy and begin your journey to success today!